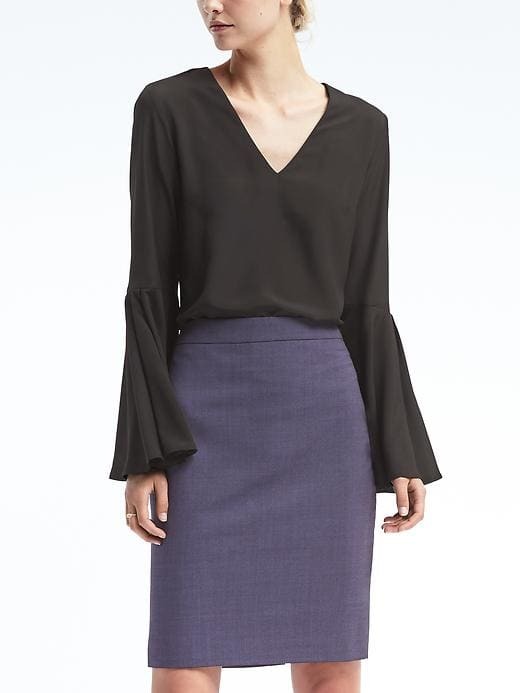 Bell sleeve may be one of the hottest trends right now but it´s not too trendy for the office. It may be feminine but it´s also elegant; and once worn with the right skirt or the right pair of pants, a bell-sleeve top can look sharp. I hope you aren´t tired of hearing me oooooze about the bell-sleeve just yet, I promise this will be the last time I will talk of the flared sleeves (at least for a while), but I just couldn´t resist featuring these looks because they remind me of a favorite top I used to wear to work when I was still teaching. It was a peachy pink with floral appliques around its V-neck, and had gorgeous quarter-length bell sleeves. I always wore it with A-line skirts. Check out these looks and the tips on how to wear them to the office. There´s something with the seaweed green (or olive green) that makes it look tough. Is it because it makes you think of the army? You see, the it may be an off-shoulder, and it may have those delicate-looking bell-sleeves, but being it in seaweed green makes the top look sharp. To make sure that you look like you mean business, team the top with a sleek pencil skirt. Because it´s black, it won´t be obvious that you´re rocking a trend of the season to the office. But don´t be afraid to show off those gorgeous bells a few times during the day – be it by raising your hand during a meeting or using appropriate hand gestures when making a point. Needless to say, because it´s black you may want to avoid pairing it with black skirts or black pants … unless you want to appear like you are grieving. 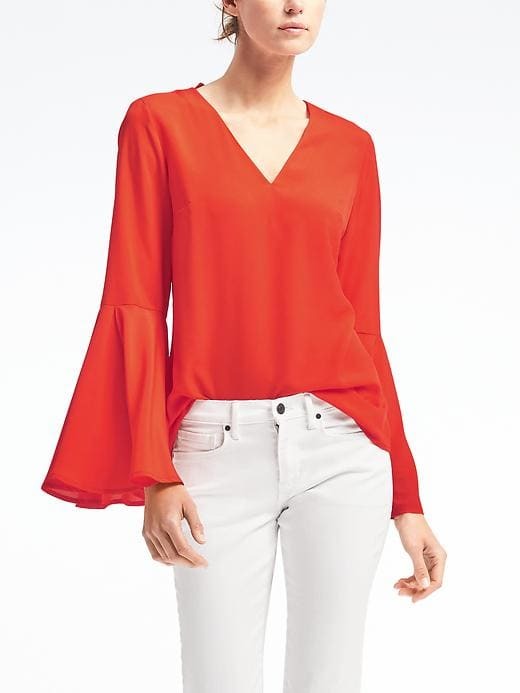 Level up your confidence in this striking Bell-sleeve top in Orange. Not many people can brave the look because of its boldness, but my advice is always team it up with white – whether skirt or trousers – in order to soften its boldness and make it look more friendly. It´s not shown clearly in this photo but this top has actually a pair of super fabulous bell sleeves. 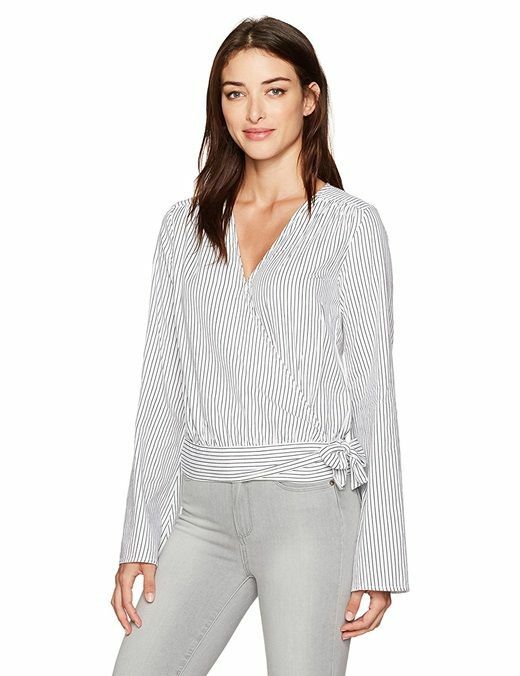 This black and white striped top also features a cross-over style with self-tie at side waist. It´s very flexible and can be worn with almost anything – for work and even for after-five. Now over to you, girls, will you wear these bell-sleeved tops to the office?